We are the UK’s leading charity dedicated to conquering stroke. We deliver stroke services across the UK, campaign for better stroke care, invest in research and fund-raise to expand our reach to as many stroke survivors as possible. There are over 1.2 million stroke survivors in the UK with 100,000 strokes happening in the UK each year. That’s one stroke every five minutes. Our mission is to prevent strokes and achieve life after stroke through providing services, campaigning, education and research. We know we need to change how people think about stroke and challenge the myths surrounding it. We push for greater awareness of stroke and its warning signs and campaign for better stroke care. Our vision is for a world where there are fewer strokes and all those touched by stroke get the help they need. research has the power to save lives and ensure people make the best recovery they can. Giveacar and its donors are proud supporters of Stroke Association as they work hard at delivering stroke services across the UK. If you’re planning to scrap or sell your car, give a car instead to help provide more education on the warning sides of stroke. Your donation can ensure patients have a better stroke care. 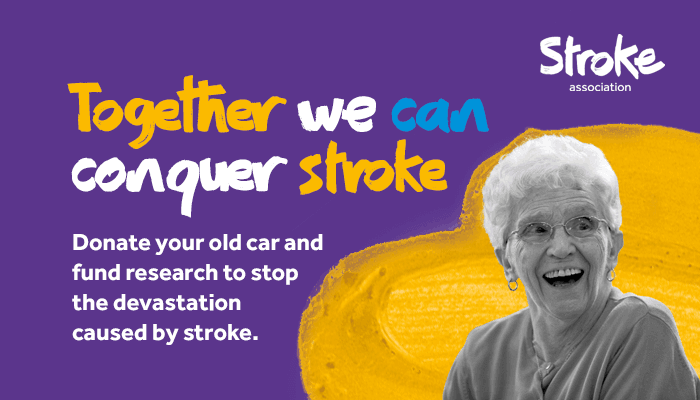 Do a good deed and help Stroke Association when you donate your car to charity. We are delighted to be one of the beneficiaries of Giveacar which we see as a unique way of raising the important funds we need. Stroke affects over 150,000 people in the UK every year. The funding from Giveacar helps us to save lives and prevent stroke. Every car donated really does make a difference. Since joining the scheme we have been amazed at how this has become a regular income source. We are very grateful to all those who have supported us through this innovative scheme, we hope it will continue so we can help more stroke survivors to make the best possible recovery they can.